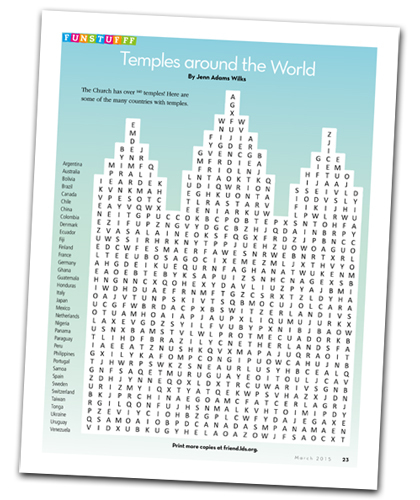 What You'll Need: GAK 502: Salt Lake Temple, Inside the Temple printable (included in lesson download), coloring page, coloring tools,wordsearch, and pen/pencil. - Have you ever seen a temple lighted at night or walked on the temple grounds during the day? What was it like? - Do we have a picture of a temple in our home? Where is it? Which Temple is it? - How do you feel when you see a temple? 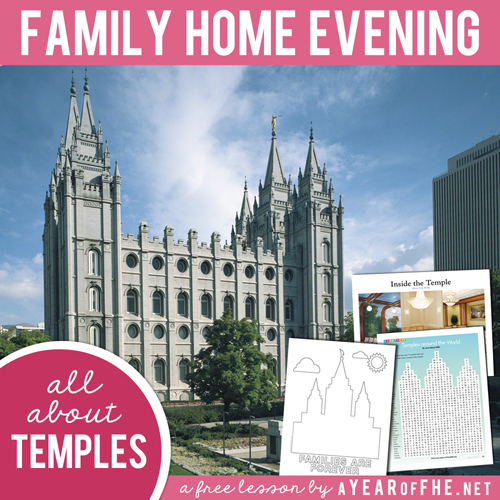 Today we are going to talk about what Temples are and why they are so very special. 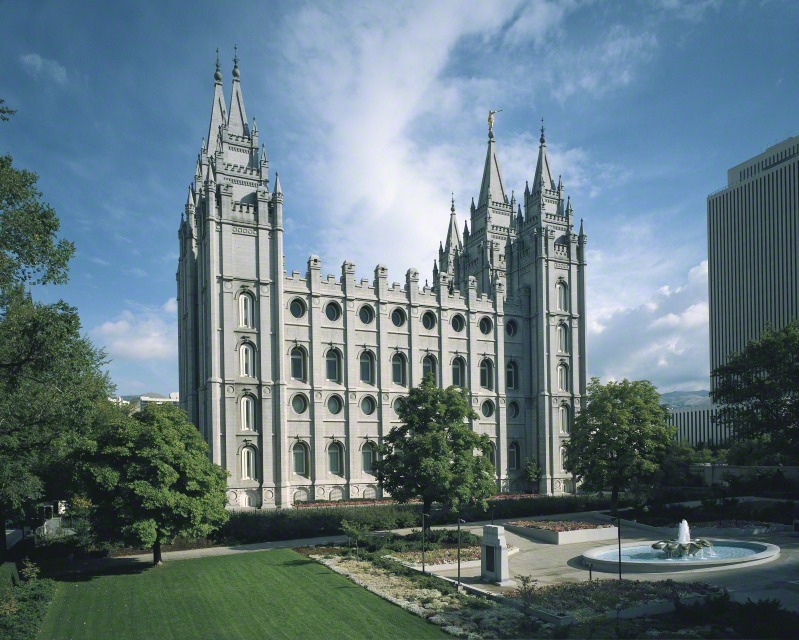 Temples are called houses of the Lord because they are the most sacred (or special to Heavenly Father) structures on the earth. Throughout history, the Lord has commanded His people to build temples. They are holy places where we make sacred promises with God. 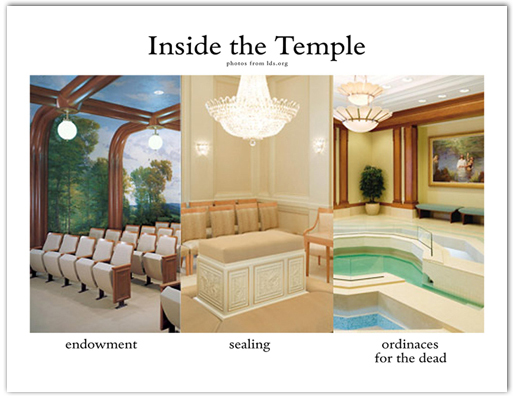 What do we do in the Temple? 1. We we are taught about the purpose of life, the mission and Atonement of Jesus Christ, and Heavenly Father’s plan for His children. In the endowment ceremony we make covenants (or special promises) with Heavenly Father that prepare us to live with him again. 2. We are sealed together as husband and wife and as families. When husband and wives are married in the Temple it means their families will be together in Heaven even after they die. 3. We do ordinances for the dead. Heavenly Father has told us that everyone needs to be baptised and receive other ordinances to live with Him again. But some people have never heard of Jesus Christ and they lived their life and died without ever being baptized. In the Temple we can do baptisms and other ordinances for them so, if they choose, they can live with Heavenly Father in Heaven too. Can everyone go to the Temple? Yes. Heavenly Father wants everybody to be able to attend the Temple. First, we must show we are worthy. Imagine that you were playing outside in the mud all day. Rolling around. Making mud pies. Getting very dirty. Do you think Mom would let you come into the house and sit on the living room couch with your muddy clothes on? Why not? (Because the house is clean and I am dirty). The Temple is like Heavenly Father's clean house. When we sin (or break commandments) we become dirty and we need to repent to be clean again. So we must be totally clean to go into the Temple because it is God's house. We also need to have a belief in the principles of the Gospel. Bear your testimony about temples. Explain that the only way families can have the blessing of being together forever is to be sealed in the temple. Bear your testimony about the blessings of temple marriage and the happiness that can come to the children if they prepare to go to the temple. Practice Song: If you are teaching your family the AUGUST Song of the Month, go over the words and music with your family. 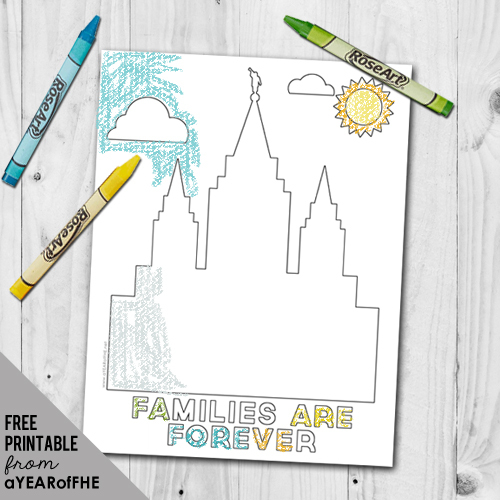 Have children draw their family in the Temple and color the page. Like this post? Check out these related articles! FAMILY HOME EVENING // Where in the World Am I From? This post may contain affiliate links for products and services I love and whole-heartedly believe in. Thanks so much for your support! See the full disclosure. How PERFECT!! We are going on a ward temple trip next weekend and this is the perfect start to our week!! Thanks!!! i just love your site. thank you for doing these lessons. i think the mobile will be a big hit tonight. Thank you so much for this! Just found your blog and I love it! Thanks for all the great ideas. This lesson is perfectly adaptable for my two very young children (3 & 2 1/2). My wife and kids think I'm a rockstar now because of "my" great F.H.E. lessons. They'er ALL YOU! Thanks for posting these. I know I can find great lessons in no time flat on your blog! My wife and kids think I'm a rockstar for "my" amazing F.H.E. lessons. Thanks for posting such great, to the point lessons that my family loves. I know I can always find a quality lesson in no time flat on your blog! Thanks for helping us do our duty! Thank you this was great! we really haven't had FHE in forever. It was nice to have a whole hour of fun with the family. The spirit was here and all was great. I guess if we do what is right we are blessed. thanks. I just wanted to let you know that we used this lesson last night and it was one of the best FHE nights we've ever had! My son is slightly autistic and it's so hard to get his attention, but your lesson was the perfect length for him! Thank you, thank you, thank you! I'm also going to take your suggestion to start taking photos ever FHE so we can remember these amazing times. I'm also planning on taking your earlier FHE lessons and doing a daily study time with my kids. I love the structure and simplicity and I've always struggled to put together small lessons by myself. found this from Ryersecrew and excited to have have the lesson done for next week. We went to the temple this week and this will be a great help for our 3 yr old to understand more about temples. Thanks! I love this. My 3 year old loves temples and I think this lesson can be simple enough for her to "teach" the lesson. I found your blog through my sister's pin on pinterest. Thank you so much for all the work you must put into these lessons. I have really been wanting to raise the bar a little on our FHE lessons and these will help tremendously! We have young children 5,2,2 it is so hard to find ideas for things to do with kids so young. Your lesson is great and will work well. Thanks again! You will be at the top of my bookmark list! This lesson was so great because now my little girl can at least say "temple" and the mobile was so cute. We actually hung it up in her room. THanks for all your hard work! Used this for the Brigham City Open House! Thanks! We are going to be featuring this post this Sunday (9/16), come stop by! Thanks so much, we are using this for FHE to prepare for the Brigham City temple dedication this week. This is great for my older kids that are going, and the activity is perfect for the little ones that can't go, but want to know what is going on! I love the temple mobile! I generally teach the lesson to my young children while they work on the art portion of the lesson- it keeps them quiet, and this one will keep them occupied for quite a while! I printed your lesson to help my 14-year old son with his family home evening lesson tonight. Thanks for putting it together. You are amazing! I searched and searched for a fun, interactive FHE lesson packet and...finally found your blog! I used this one for our family FHE tonight and we'll be using the Plan of Salvation lesson to prepare our ward's young women to teach their families. I appreciate all the work and details you put into each lesson; thank you, thank you! This is awesome! The pictures and the mobile are great! Thank you! This is perfect as we got to go through a temple open house this week. So many good ideas! Thank you! DISCLAIMER: The products offered by A YEAR OF FHE are neither made, provided, approved nor endorsed by Intellectual Reserve, Inc. or The Church of Jesus Christ of Latter-day Saints. Any content or opinions expressed, implied or included in or with the goods offered by A YEAR OF FHE are solely those of A YEAR OF FHE and not those of Intellectual Reserve, Inc. or The Church of Jesus Christ of Latter-day Saints. Regular participation in family home evening will develop increased personal worth, family unity, love for our fellowmen, and trust in our Father in heaven. It is our promise that great blessings will come to all who conscientiously plan and hold weekly family home evenings. Copyright © 2010-2018 Emilie Ahern. The content on these pages may be used and reproduced without consent for home and personal use. Content being shared on other online communties MUST be properly credited and linked back to this blog. Content including lesson plans, themes and original artwork may NOT be reproduced for SALE or for any financial gain.